The UFC was back in Sao Paulo, Brazil last night (Sat. September 22, 2018) from the Ginásio do Ibirapuera. The card has seen several changes to its main event over the course of the last month. 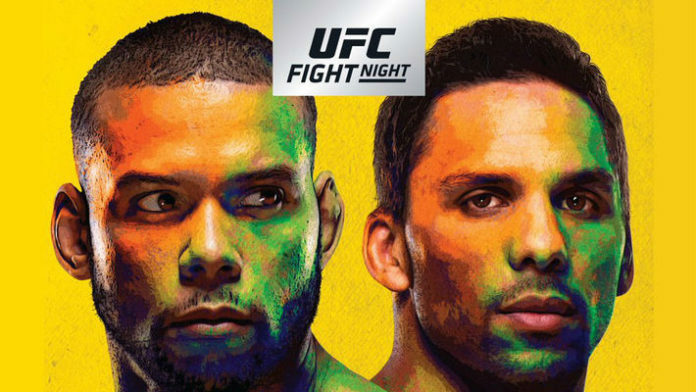 However, it ended up being Thiago Santos and Eryk Anders in the headliner at 205 pounds. Santos and Anders but on an amazing slugfest, but at the end of the third round Anders was unable to walk accross the Octagon to his corner. The referee stopped the fight and awarded Santos the TKO win. Also, in the co-featured bout of the evening, welterweight Alex Oliveira laid waste to Carlo Pedersoli Jr. There were several well-known Brazilian MMA legends on the night’s card as well, including heavyweight veteran Antonio Rogerio Nogueira. Anders catches a kick from Santos and takes him down, but Santos is right back up. Santos responds with a judo throw but can’t complete the takedown. Anders now pressures Santos against the cage for a takedown. A knee to the face lands for Sanders against the cage. Santos is able to separate himself from the cage and circle out. Hard body kick lands for Santos and he follows up with a head kick that’s barely blocked. A clinch ensues and Anders gets dominant position against the cage. Santos is able to separate again. A spinning back kick misses for the Brazilian. A nice 1-2 combo lands for Santos. The round comes to an end. These guys go right into a slugfest and Anders dives in for a takedown. Anders lays on the canvas and lets Santos come down on top into his guard. Santos ground-and-pounds his way back into Anders’ guard after briefly standing up. Anders explodes up to his feet but now Santos is unloading the strikes. Anders responds with some of his own but Santos takes them well. Anders walks Santos down and eats a body kick for it. He responds with a nice straight. Santos explodes with a combination and Anders basically stops the fight himself after alleging an eye poke. After a few seconds, the action resumes and the round comes to an end with an Anders takedown. Leg kicks from Santos are wobbling Anders. Anders lands a heavy shot that rocks Santos a bit and allows him to get a takedown. Anders is able to take the back. Now Anders is going for a rear-naked choke but Santos hand fights nicely. A failed transition to full mount from Anders costs him top position. Santos explodes to his feet and lets off a barrage of strikes. Santos is landing some nice shots here. Anders is able to clinch Santos and get him against the cage. Anders gets the takedown into half guard. Elbows land for Anders in the top position. Santos is back to his feet but Anders is back in on the takedown. Anders gets the takedown but is eating big elbows that are cutting him open. Anders is eating some heavy shots while in on his takedown defense. The round comes to an end, however, Anders is unable to get to his feet and make it back to his corner. The referee calls the fight off. It’s over.